Please refer to our stock # 1967 when inquiring. 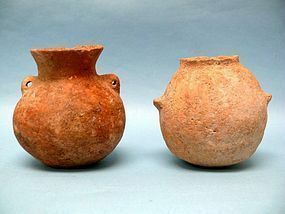 SOLD SEPARATELY: Two Chalcolithic Pottery Vessels, ca. 4400 - 3300 BCE. Found in the Holy Land. One a reddish pottery amphora at 4" high and one buff pottery flanged vessel at 3 3/4" high. Both intact and in excellent condition. The discovery of the metal in the Chalcolithic Age resulted in the development of trade between the local or remote civilizations, and they established a well network of trading centers where they had exchanged commodities. This caused the invention and development of writing which they used to keep the record of their inventories. Asia Minor that was the leader in urban development and civilization during the Neolithic period has lost its leader position towards the end of Chalcolithic Period, because Mesopotamia and Egypt had invented writing and reached a high level of civilization. Asia Minor has followed Mesopotamia and Egypt about 1,000 years late in the invention of writing. During the Chalcolithic period of time, the most striking development was the extensive use of Copper. Until this period, the only material that the humankind had used to make their weapons was natural stones. Now, they learned to process and shape this metal copper to make strong weapons and also ornamentation. We also see a considerable increase in the number of towns that scatter here or there. The new towns of this period were usually built on the water or in rich valleys. The great mother goddess of Asia Minor was the main deity and they have made many figurines of this goddess which they used in their religious rituals. The burials that were within the houses of preceding Neolithic period now take place outside the towns.